Leaf: basal and cauline, alternate, long-petioled, widely ovate; base deeply cordate; margin entire or toothed; gradually reduced distally on stem. 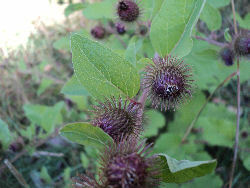 Inflorescence: heads discoid, in leafy-bracted clusters; involucre +/- spheric; phyllaries graduated in many series, ± linear, bases appressed, tips stiffly radiating, hooked-spiny; receptacle +/- flat, epaleate, bristly. Flower: many; corolla pink to +/- purple, lobes narrowly triangular; anther base tailed, tips ovate, acute to obtuse; style branched just above distal hairy ring, branches oblong, obtuse. Fruit: +/- compressed, rough or ribbed, glabrous, attachment basal; pappus several series of rough bristles, readily deciduous. 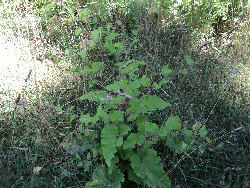 Arctium lappa is a BIENNIAL growing to 2 m (6ft) by 1 m (3ft 3in). It is hardy to zone (UK) 3 and is not frost tender. It is in flower from Jul to September, and the seeds ripen from Sep to October. The flowers are hermaphrodite (have both male and female organs) and are pollinated by Bees, lepidoptera, self.The plant is self-fertile. 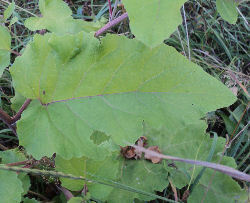 Immature Flower Stalk: The young stems and leaf stalks are said to be good if peeled of every shred of the rind which would probably be bitter tasting. The inner pithlike material may be eaten raw or it may be better if boiled with one or two changes of water [Harrington]. Preparation: Peel them, parboil 1 minute to dispel the bitterness, add them to soups, stews, or casseroles, or enjoy them plain. You can do the same with the long leafstalks, but they're less substantial and harder to peel [Wild]. Cooking: Wrap fish and game in large burdock leaves and roast in the coals of a fire pit. Foods cooked this way are mildly seasoned by the leaves [Nyerges].